"The Legacy of Jackson Pollock"
This form of art, as yet without any widely accepted nomenclature, was in need of commentary, and Kaprow provided this in an essay, at greater length than was possible in the exhibition pamphlet. Timed to coincide with the opening of his second Environment at the Hansa Gallery, in October 1958 Art News published "The Legacy of Jackson Pollock. "14 In this essay, Kaprow outlined the thinking that had led to his Environment and, in so doing, cast light on his future production. He also established the credentials of his work by staking his claim to the legacy of none other than Jackson Pollock, who had died in a car crash in 1956. Kaprow diagnosed a tragic component in Pollock's life that had less to do with his sudden death than with the precarious state of art at that time. He suggested that Pollock's role as a heroically self-sacrificing artist had become as untenable as the situation of contemporary art in general, which now appeared to be doomed to either eternal repetition or regression. Kaprow came up with two provocative notions. First, that modern art-or as we would say today, Modernist or Late Modernist art-had become a thing of the past, at the latest with Pollock's death. He presented the art of the 1940s and 1950s as a historical phenomenon that had already come to an end-of course he was making this point before the term postmodern had become common currency.15 Second, he suggested that as an artist, Pollock had been playing a role. Although Kaprow does not explicitly talk of a role, nevertheless his references to Pollock's "gesture," to his being "in the work," to his interest in the "attitude" of the Surrealists, to his work as an "act," and to the "acrobatic" aspect of interpretation all testify to the fact that Kaprow imagined the artist as an actor of sorts, as someone who is performative in his demeanor and actions. He took the notion of the author behind or above the work and replaced it with the idea of the artist as an actor in a scenario that neither the artist nor the viewer can fully take in. Pollock, as I see him, left us at the point where we must become preoccupied with and even dazzled by the space and objects of our everyday life, either our bodies, clothes, rooms, or, if need be, the vastness of Forty-second Street. Not satisfied with the suggestion through paint of our other senses, we shall utilize the specific substances of sight, sound, movement, people, odors, touch. Objects of every sort are materials for the new art: paint, chairs, food, electric and neon lights, smoke, water, old socks, a dog, movies, a thousand other things that will be discovered by the present generation of artists. Not only will these bold creators show us, as if for the first time, the world we have always had about us but ignored, but they will disclose entirely unheard-of happenings and events, found in garbage cans, police files, hotel lobbies; seen in store windows and on the streets; and sensed in dreams and horrible accidents. An odor of crushed strawberries, a letter from a friend, or a billboard selling Drano; three taps on the front door, a scratch, a sigh, or a voice lecturing endlessly, a blinding staccato flash, a bowler hat-all will become materials for this new concrete art. It is nothing short of astounding that Kaprow anticipated the artistic issues of the immediate future with such accuracy. The different role of the viewer, the advent of performativity, the engagement with popular culture, and the transformation of spatiality are all prefigured in this text. And so it was that in 1964, for instance, when Frank Stella delivered his verdict on "relational painting," he was in effect implementing Kaprow's critique of relational composition methods.20 Moreover, Kaprow's text is still regarded as a "manifesto for the Pop generation,"21 even as a "prophetic statement. "22 This article in Art News made such an impact above all because Kaprow managed to communicate the concerns of a younger generation of artists while outlining a vision that was as inspiring as it was vague, with the result that numerous artists read it as a reflection of their own thinking. What looked to many at the time like plagiarism can now be seen as the outcome of an entirely deliberate approach to art as a commentary on the status quo, which is wholly in keeping with Kaprow's skepticism regarding the Modernists' expectation of constant innovation. For the differences outweigh the formal similarities between Kaprow's assemblages and Environments and Rauschenberg's Combines. Kaprow's works are not about adding and combining decipherable codes from the repertoire of art history and popular culture. They are much more about the contingent superimposition of sense impressions, which-since they have no fixed meaning-cannot be unraveled like some kind of mystery. Typical of these is the collage Hysteria (1956), whose whole picture plane is pasted or painted with the word Haha. The paint surface consists of a mass of interlocking letters that cannot be taken apart and reconstituted in their original form. Whereas Rauschenberg took the view that all lines of communication are of equal value, regardless of direction, Kaprow's interest was in the errors and faults that can arise during the process of communication. And while Rauschenberg, in his role as a mediator between different levels of representation, was constantly colonizing new terrain and themes for art-thereby reinforcing its hegemony in the cultural arena-Kaprow questioned the basic precepts of art by seeking out confrontation with nonartistic realms. Kaprow was the only member who already had a university post by the mid-1950s. While studying for his master of arts at Columbia University under Meyer Shapiro, whom he described as a "rara avis" among art historians, someone who was at home with the art of both the past and the present, Kaprow had also studied painting with Hans Hofmann. Although he had not published his master's thesis, "Piet Mondrian: A Study in Seeing" (1952), it nevertheless qualified him to take up a position, in 1953, as an instructor of art history and art for Rutgers University at Douglass College. From 1956 to 1961 he held the post of assistant professor and actively encouraged other artists to take up teaching posts at Rutgers.45 Lichtenstein, who had taught at various universities since the mid-1950s, became an assistant professor at Rutgers in the summer of 1960;46 Robert Watts and Geoffrey Hendricks were also faculty members; Lucas Samaras and Robert Whitman studied under Kaprow; and George Segal graduated from Rutgers with a master of fine arts in 1960. However, Kaprow left Douglass College following a dispute that arose when some of his colleagues deemed a particular work by Samaras to be obscene. After a short spell at the Pratt Institute, in 1961 he was appointed an associate professor in the Department of Fine Arts at the State University of New York at Stony Brook, where he subsequently held the position of professor from 1966 to 1969. At this point his career as a university teacher took him to the West Coast, where he was to remain. Having spent 1969-1973 as associate dean at the California Institute of the Arts in Valencia, in 1974 he was appointed a professor in the Visual Arts Department at the University of California, San Diego, where he was also department chair from 1985 until his retirement in 1993, when he became a professor emeritus. The members of the Hansa Gallery did not regard their cooperative as a programmatic league to promote any particular artistic approach; they viewed it quite pragmatically as a potential springboard for their individual careers. Although they occasionally invited speakers-including Clement Greenberg in the mid-1950s-the members did not pursue any shared theoretical aims.50 They did not even agree in their attitudes toward Abstract Expressionism. However, they did attract considerable attention. Exhibitions at the Hansa Gallery were regularly reviewed in Art News, whose editor-in-chief, Thomas Hess, looked kindly on the group. By the mid-1950s the members' efforts were beginning to bear fruit. With the marked rise in prices being paid for Abstract Expressionism, there was a growing demand for new, less expensive art. Paintings and sculptures by Hansa artists, such as Müller and Segal, and especially large-format assemblages by Stankiewicz were now shown in prestigious group exhibitions and increasingly bought by art museums. Consequently the Hansa Gallery was able to move from downtown New York to uptown, to the southern end of Central Park, and to employ a professional business manager who earned a commission on his sales. Kaprow now set about building on the reputation he had made for himself with his Environments and "The Legacy of Jackson Pollock." He spent three months preparing an event for the beginning of the 1959 art season-an event that was to go down in the history of art as the first ever Happening. After the summer vacation, art lovers in New York received a form letter from Reuben-Kaprow Associates announcing that "eighteen happenings will take place." The recipients were invited to become part of these Happenings and to experience them in the company of other spectators: "Do not look for paintings, sculpture, the dance, or music. The artist disclaims any intention to provide them. He does believe that he provides some engaging situations." The letter closes with the words "The present event is created in a medium which Mr. Kaprow finds refreshing to leave untitled. "53 A press release announced that the Reuben Gallery would have a grand opening in the autumn, not with easel paintings but with an "event. "54 Later onflyers were sent out with the title "18 Happenings in 6 Parts. "55 Some people also received individual invitations, consisting of a plastic bag that contained, besides the flyer, scraps of paper, photographs, wood, cinnamon sticks, and cutout figures.56 The recipients of the flyers learned that the event would be held in three rooms, that there would be actors and slide projections, that the "actions will mean nothing clearly formulable," and that the "whole work is to be intimate, austere and of somewhat brief duration." They were also asked to indicate whether they would be attending, because of the limited number of places available, and to make a financial contribution. Unlike the Environments, the first Happening is well documented, thanks to the detailed description, including a number of photographs, published by Michael Kirby in 1965 in his book Happenings. In preparation for the event, Kaprow had erected a temporary stage set in the loft. Opaque plastic sheets fixed to wooden frames divided the space into three "rooms" of different sizes. According to Kirby, in room 1 there were around thirty folding chairs facing the other rooms, which were only indistinctly visible through the plastic sheeting. Red and white bulbs were suspended from the ceiling and bathed the room in a pink light. The walls, as in Kaprow's earlier Environments, were covered with assemblages of wax fruits, scraps of paper, and mirrors. In room 2 there were two groups of around a dozen chairs, facing each other. A single lamp bathed the space in blue light, and colored Christmas lights bedecked the walls. In room 3 there were fifteen chairs, placed so that they faced the other rooms. As in room 1, there were light bulbs suspended from the ceiling, this time blue and white. Fixed to the plastic wall between rooms 2 and 3 were variously colored foil rings. Another wall was made from a screen collaged with words and fragments of words. The audience took their seats. A bell sounded to announce the beginning of the event. Loud, dissonant, electronic noises from four tape recorders sounded from loudspeakers. Actors appeared in ordinary day wear, men in room 1 and women in room 2, and, like robots, executed a number of gymnastic exercises, strictly according to Kaprow's choreography. In the darker room 3, there were slide projections of children's drawings and Kaprow's paintings. Part 1 of the event ended after five minutes. After a short pause, part 2 began, with two actors in suits carrying placards on small sticks and reading out sentences on the placards in loud voices. The audience heard fragmented utterances on the subjects of time and art. Samaras was the speaker discussing art and came out with sentences such as: "I was about to speak yesterday on a subject most dear to you all-art. I wanted to speak then about art, but I was unable to begin. "61 In room 3 there were more slides, this time of masterpieces of European art. This was followed by a fifteen-minute interval, during which visitors moved to a different room depending on the instructions on their cards. Couples and friends who had come to the event together found themselves separated. Some people were instructed to stay where they were, since all three rooms did not have the same number of chairs. The final part of the event took place without sound. In room 1, two actors performed a symmetrical synchronized sequence of movements. In room 2, two female actors stood stock still, facing the audience. After a time the four actors came together in the central room. They pulled rolls of colored paper down from the ceiling and started to read out the one-syllable words written on them. The voices merged, creating a Babylonian confusion that Kirby reproduced as "eh?," "mmmmmm ... ," "uh," "but," "well," "oooh...." In room 3 the lights went out for the last time and a single slide was projected, showing a detail of Kaprow's face-his mouth and chin (see figure 6). When the bell rang out twice, the last of the eighteen Happenings was over. In that same year, 1988, Kaprow presented a new version of 18 Happenings in 6 Parts in New York, although with an entirely different score, without an audience, and with little response from the art world.75 In 2006, shortly after Kaprow's death, André Lepecki presented a replica in Munich, which conveyed a sense of the progression and the atmosphere of the work.76 And in the autumn of 2006, Christoph Schlingensief presented a walk-in installation titled Kaprow City at the Volksbühne in Berlinalong with a two-hour performance involving members of the audience, which explicitly drew on 18 Happenings in 6 Parts. It is as though 18 Happenings in 6 Parts actively invites historic reenactments, however incomplete. This innovative study of two of the most important artists of the twentieth century links the art practices of Allan Kaprow and Robert Smithson in their attempts to test the limits of art--both what it is and where it is. Ursprung provides a sophisticated yet accessible analysis, placing the two artists firmly in the art world of the 1960s as well as in the art historical discourse of the following decades. Although their practices were quite different, they both extended the studio and gallery into desert landscapes, abandoned warehouses, industrial sites, train stations, and other spaces. Ursprung bolsters his argument with substantial archival research and sociological and economic models of expansion and limits. Philip Ursprung is Swiss National Science Foundation Professor for Art History at the Swiss Federal Institute of Technology in Zurich, Visiting Curator at the Canadian Centre for Architecture, and an elected member of the Swiss Federal Commission for the Arts. 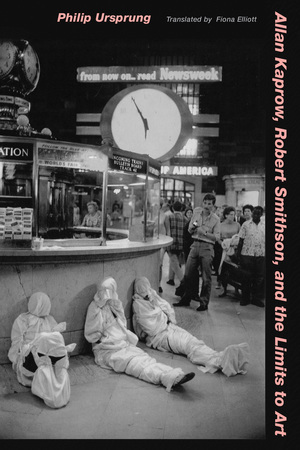 "Dr. Ursprung’s exquisite research yields valuable knowledge concerning two of art history’s most underserved artists, Allan Kaprow and Robert Smithson, to propose that the assumed contiguity of traditional art history has marginalized both Kaprow’s Happenings and Smithson’s oeuvre. Moreover, the author reveals the importance of photography and writing in both of the artist’s works, and how their expansion of the artwork as textual and discursive has been thus far ignored by traditional art historian definitions." "Although few post-1945 American artists more nimbly pushed the limits of art than Allan Kaprow and Robert Smithson, their multivalent practices in which writing figured prominently seldom have been considered in relation to each other. In this scrupulously researched, methodologically heterodox, and highly readable book, Philip Ursprung snaps off the handcuffs “happenings” and “earthworks” and allows his subjects to walk free so as to juxtapose their achievements and present the most nuanced and illuminating account of them we have to date. The result is a landmark study of the reconfiguration of the environment of art and a fearless contribution to understanding the present, not least of all the role of institutions and historians in monopolizing cultural meanings."